When learning new movements in skiing, our brains are generally on the defensive and exaggerate all sensory inputs. We need to exaggerate our movements to compensate for that and MOVE MORE to reach the needed ranges of movement, especially if you want to improve faster. As you start gliding on skis, you'll feel you're going really fast, but in fact you're gliding really slowly. The same will occur with all ranges of all movements: you will feel like you are angulating soooo much and have the hips soooo low, but a video review may reveal that you were pretty much standing upright!!! The skier on the left felt that his range of movement at the time was every bit as big as the skier on the right, but was in fact very far from where he needed to be. It took a few seasons of work for the ranges of movement (flexing and tipping in this case) to get better! He needed MORE! 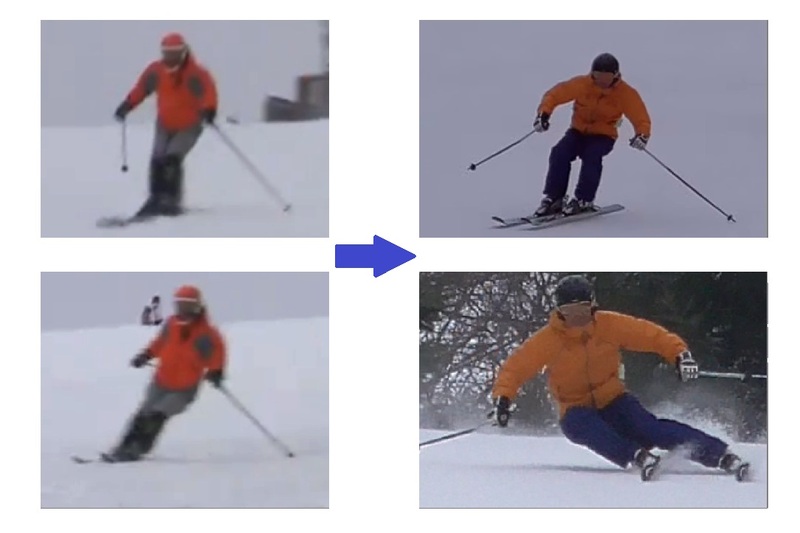 We need to exaggerate all movements and push the boundaries of our range of movements, in our path to expert skiing, so we improve with the rule of MORE: move MORE! Exaggerate movements: you can always throttle it back if you overdo it, but you are likely not doing enough to improve! Do MORE! Review video often and compare with the reference videos here and see how your range of motion is. Often, new movements and ranges of motion will feel funny. After all, we're not used to them, take Flex to release - the range of motion required at the expert level is huge, compared to an advanced skier and it may take you entire seasons of dedicated practice to acquire it and embed it in your normal skiing. The main reason being that it will feel very strange (besides perhaps a lot more athletic than you're used to). Since these feel strange initially, it is important that you validate that you're on the right path and are working indeed on the right movements, so do a lot of video and review it - best while still on the slope. Even a simple phone 10 second video on a green slope can show you if you're moving in the right direction or not! The sweet spot of practice, the "challenge zone"
Modern learning theory confirms that we learn on the edge of performance. Our brains are built to learn, evolve and improve when on the edge of failure. Failure not as in an impending doom or crashing, but failure to reach the goals of the drill. For instance, the proper "challenge zone" is when you succeed 2 out of 3 times. If you try a new movement or a new range of movement and reach it every time, you are not challenged and you are not evolving. If you fail every 3 attempts or so, then you know you're in the challenge zone. So, since we tend to be conservative and exaggerate feelings, MORE is right. However, don't confuse "failure" above for crashing - it simply means not achieving the goal of the drill, i.e. not really touching the boot or not really touching the snow or not really being on the right line etc. Try to exaggerate, within reason, the strain on our bodies and muscles, when learning new movements, to stretch the ranges of movement quickly and not spend seasons struggling with half-measures! However, do always validate with video and feedback that you are on the right path! Viewed 209 times ( | Print ) this page.